Our marbling kit is simple to use, designed for most ages (adult support is required). 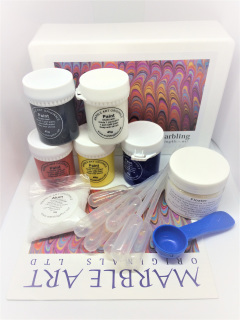 The kit gives excellent results on all natural materials, for example; cotton, silk, satin, linen, unbleached calico, viscose, lightly tanned leather, wood, paper, unglazed ceramics and so on. Red, Yellow, Blue, Black, White. 90ml each when diluted 1:1 water. 8 x pipettes as all colours mix into an infinite range of colours. Floater powder Pot with blue 5ml spoon (water thickening agent which lasts up to 36 months. ​Double A6 trays for printing. ​Non-toxic, water based, child safe & mesmerizing fun !!! ​''Excellent. Its an affordable price for trying a new hobby.'' Gary Hawkins.